Grey-green Garden, Designed by Greg Hebert Landscape Arch. Designer: Greg Hebert Landscape Arch. This evergreen succulent-looking tree slowly grows to is similar to a palm tree and will grow 25' tall and wide. End of branches have large, sword shaped, blue green leaves which can by 2' long and 1.5' wide! This unusual looking tree produces clusters of green white flowers on the end of the branches during summer, followed by orange berries. However, it may take 10 years before blooms appear. Trunk is gray, single and smooth, with multi-stemmed branches. This tree does best in full sun with well draining, fertile soil. When established, it is drought tolerant. This plant also grows indoors, with strong indirect light. It can reach 3' tall. Interesting note: if the bark is bruised or cut, it may "bleed" a reddish resin which can be used to stain wood. This resin is called "Dragon's blood". Kleinia is a spreading succulent and ground cover that grows to about 6" to 18" tall with florescent blue green foliage. The ice plant like leaves are long and slender.It is from South Africa and works well in Mediterranean gardens. It is good in most sun conditions and can take very little watering or regular garden watering making it very adaptable for garden design. It performs best with full sun and regular water. 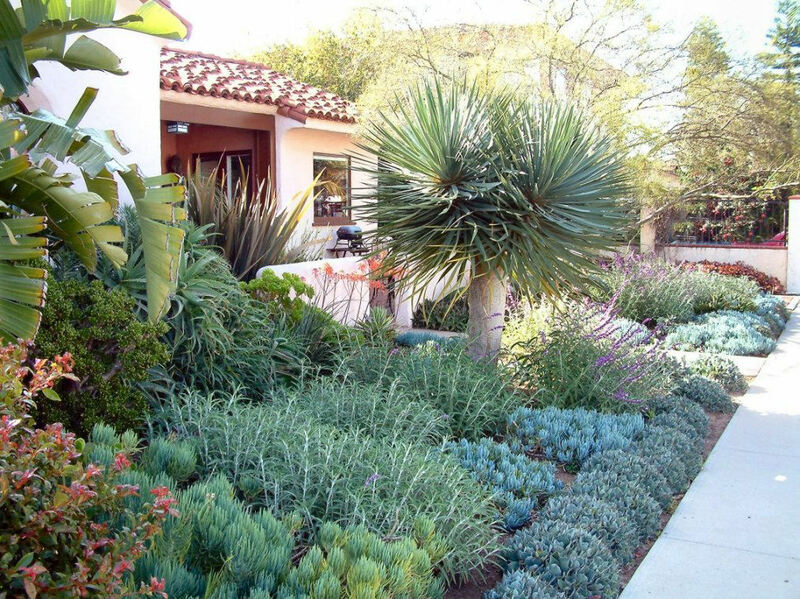 Once it is established it is very drought tolerant. It is easy to propagate as are many succulents. Any section of the plant broken off and dug into the soil will reroot. Phormium tenax 'Atropurpureum' is an evergreen perennial. Big, dramatic plant composed of many swordlike, stiffly vertical leaves can reach 5' tall. Leaves are purple red. Flowers stems reach high above leaves, bearing clusters of 1"-2" blossoms in dark red. Crassula ovata is an evergreen shrub that grows to 3'-10' tall and 3'-6' wide with gray green, oval, glossy, leathery leaves with red margins (more red appears with more sun). During the winter and spring, small pale pink, fragrant flowers cover the plant. It likes afternoon shade, low watering, and will live in any type of well drained soil. It can be grown as a houseplant but will not bloom. Trunk and branches are thick and gnarled. Flowers attract bees, wasps, butterflies, flies and beetles. Looks great in containers. This clumping evergreen perennial can reach 25' tall fairly quickly, forming a false trunk from the base of the leaves. The leaves are shaped like bananas, reaching 10' long with the widest part reaching 5'. It does best with fertilizer once a month and rich, well draining soil. It can be planted in full sun but will do better if it receives afternoon shade. The flowers can reach a size of 10"-12", but plants need to be a few years old before they will flower. Mostly grown for tropical effect of large leaves. This succulent is large, full of branches and produces deep red orange blooms in fall and winter. The flowers produce a nectar that is attractive to many different birds; this plant is grown all over the world. This succulent can reach 8' tall and 5' wide. Leaves are narrow, recurved and tooth margined and can be green or yellowish or blue green, depending on how much sun it receives. It tolerates sun or shade. This succulent perennial will only grow 1' tall and 1' wide. It has large, sharp, dark green leaves and clusters of red-orange flowers that bloom in summer. Gold Tooth Aloe drought tolerant when established, native to Africa, forms rosettes heavily offsetting to form wide clusters. Has beautiful golden orange tubular flowers seasonally. Hummingbirds are attracted to this plant. Porous soil with adequate drainage and protection from frost is needed to keep this plant healthy. This succulent perennial will grow 4'-5' tall and wide. It has thick, silver gray leaves with a tint of pink around the edges. It will do best in partial shade to full sun with well draining soil. It is drought tolerant once it's established. Be careful not to overwater. It does not tolerate humidity and hot evenings. White flowers appear in spring but this is rare in cultivation. This plant can be used indoors but needs bright light. Looks great in containers.